Machine Screws are sometimes referred to as "Stove Bolts" and have machine threads. They are commonly used with a Nut or in a pre-tapped hole with matching threads. They have a straight shank and are threaded along the entire length of the shaft (to the head) and designed to bind metal to metal but sometimes used in other applications. 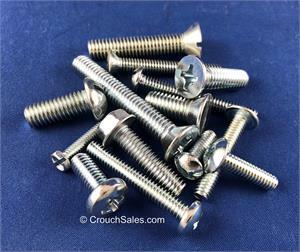 Machine Screws are fully threaded zinc plated screws commonly used with a machine nut and are available in a variety of diameters from 2/56" thru 3/8-16 and lengths from 1/8" thru 6" in several head styles such flat head, hex head, pan head, oval head, round head, and truss head. Machine Screws are available in phillips drive, slotted drive, and hex drive. Phillips machine screws we stock include phillips flat head machine screws, phillips oval head machine screws, phillips pan head machine screws, phillips truss head machine screws. Slotted machine screws we stock include slotted flat head machine screws, slotted pan head machine screws, slotted round head machine screws, slotted truss head machine screws, slotted hex washer head machine screws, and we also have unslotted hex washer head machine screws. Select the drive and head style of the zinc plated machine screws you are searching for below. Phillips Flat Head Machine Screws Zinc Plated are fully threaded countersunk machine screws to the bottom of the flat head and commonly used with a machine nut and available in 2/56 thru 3/8-16 diameters and 1/8" thru 6" lengths. Slotted Hex Washer Head Machine Screws Zinc Plated are fully threaded hex head machine screws with a washer beneath the head commonly used with a machine nut and available in 2/56 thru 3/8-16 diameters and 3/16" thru 5" lengths. Slotted Pan Head Machine Screws Zinc Plated are fully threaded machine screws to the bottom of the pan head and commonly used with a machine nut and available in 2/56 thru 3/8-16 diameters and 1/8" thru 6" lengths.